For a month or so I worked on a MG novel that was slow going. I mean, reallllly slow going. Last week, after another frustrating day of writing, I threw my hands in the air and said, I give up. I didn't have all the pieces to write it, and more importantly, I didn't know WHY I was writing it anymore. I just didn't care. It was time to step away for awhile. But last week I also flipped through my idea journal and stopped at a page I remember writing one day last fall, after I'd read a middle grade novel that really inspired me. The page wasn't anything that made much sense. It was mostly a list of items I liked the idea of including in a story, and that was it. 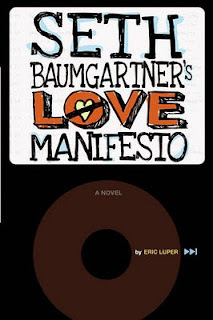 I stared at the page for a long time and thought, I want to write THIS book. Even though, at the time, I had no idea what "THIS book" was. I stared at the page, and then out the window, and then at the page again, and low and behold, a bit of a premise came to me. And Thursday, I started writing. Since Thursday, I've written almost 9,000 words. I am happy again! I am excited again! I care about the story and all the characters and when I'm not writing, I'm still thinking about them. You know what I'm talking about - when you just can't turn it off. I'm there. I'm finally there with something!! 1. So jealous of everyone who was at BEA. Sounds like everyone had a great time, sore feet and all. 2. I've had a ton of reserved library books come in over the past few weeks, so I haven't read as many of the ARCs I got at TLA as I'd like. But I did read two of them, and I loved them both. 3. Between being sick and the icky, wet weather we've had lately, I hadn't been on a walk in awhile. Yesterday morning, the sun was shining, and so off I went with the dog. Glorious! Please, let's have more of that this weekend, shall we? 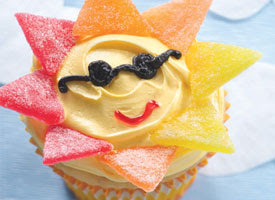 How about a sunshine cupcake for some good luck? 4. I started a new story yesterday. I'm in that happy, honeymoon phase. I just want to stay in my office and write all day. Although the bathroom needs cleaning. And the floors need mopping. And the cupboards need filling. Any guesses as to how I'll end up spending the day? 5. School isn't out here until June 17th. If I'm not blogging much the next few weeks, you know why! I have a book to write while the house is still quiet!! 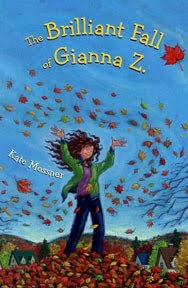 HOORAY FOR KATE MESSNER and THE BRILLIANT FALL OF GIANNA Z! Laurie Halse Anderson captured the award announcement on her blog - if you haven't seen it yet, go watch. So exciting!! Congratulations Kate. It couldn't happen to a nicer person! Ansel Adams is a fan of that quote. For he understands that if he were to wait for everything in the shot to be perfect, he would never take the shot. And wouldn't that be a shame? "To demand perfection is to deny your ordinary (and universal) humanity, as though you would be better off without it. Yet this humanity is the ultimate source of your work; your perfectionism denies you the very thing you need to get your work done. Getting on with your work requires a recognition that perfection itself is (paradoxically) a flawed concept." I think every author struggles with the issue of perfectionism in one way or another. For me, it's more of a big picture thing - I'm not as good of a writer as I wish I was, and sometimes that keeps me from opening the document. Like - what's the point? Why even try? So I have to get over that thing and open the document and get lost in the story, and then, I'm fine. Sure, the inner critic can be annoying some days, but I'm not paralyzed because each sentence isn't perfect. But I know some writers struggle with it more at that level. With each of my published books, there was point where the thoughts and worries of my brain disappeared and all that was left was the story of my heart that I just had to share. I remember when I wrote I HEART YOU, YOU HAUNT ME I was so excited about the story I was telling. The way I was telling it was new and different for me, though, which was really scary! I didn't know if I was doing it right or if it was any good or any of that. But eventually, it just didn't matter anymore. The story - of love and loss, of healing and hope - it mattered. And in my heart, I knew that, and it kept me going. But we all know there IS such thing as a good story. A story from the heart. I'm really excited that I HEART YOU, YOU HAUNT ME has been named the runner up in the South Dakota YARP Teen Choice Awards!! It lost by just a few stars to Jay Asher's 13 REASONS WHY. Thank you teens of South Dakota, I'm honored to be in such great company! To celebrate, let's have a contest, shall we? I have some FANTASTIC ARCs of some highly anticipated YA novels I collected at the Texas Library Association Conference. I will send ALL FOUR OF THESE ARCs to ONE lucky winner. So how do you enter?? There are a few different ways. 1) Comment at my blog on LJ OR Blogger for ONE entry. Easy peasy. Contest open to US residents only, sorry. Or, if you have someone in the US who I can ship to and they will mail them to you, that's fine too. This contest will go through midnight Sunday, May 23rd. I will draw a winner's name Monday, May 24th. What an amazing weekend. The librarians and all of the volunteers work SO hard to pull this event off and make it something special and BOY is it something special. I feel so blessed to have been a part of it. We all really felt like rock stars. I took the red eye Thursday night and flew into JFK, then wandered around blurry eyed in my practically pajamas attire, waiting for my flight to Rochester. I met Barry Lyga and Robin Brande there, since we were all on the same flight. They were very kind to this very tired traveler. Later, after I napped and showered, and was heading down to meet my friends Kate and Deena, Barry was in the elevator and he said, "Wow, you look much better." Hahahaha. Here's Deena Lipomi and Kate Fall, my friends who I blog with over at Author2Author. It was great to meet them for the first time!! This is the wonderful author dinner Friday night at the Strong National Museum of Play. Look what was at each author's place setting!! That is a cookie, and OMG, it was the most delicious cookie I have EVER had. Seriously. This is the limo ride. On the right is Martin Wilson and THE Simone Elkeles. Way in the back you can see Coe Booth, who I was thrilled to meet for the first time and chat with a little bit. And this is the fabulous Sarah Ockler and the funny James Kennedy. A marching band led the two limos into the campus, where we were greeted with cheering fans. So cool! The authors used the special, secret tunnels underneath the college campus to avoid the crowds above. There was some cool artwork down there! In the gym, they had huge posters of each of us so kids could find the line they wanted to stand in to get their books signed. SO COOL!! Finally, I had two teen helpers throughout the day, and they were SO wonderful. When Anthony met me, he said, I read your book twice, I liked it so much, and he had a copy of I HEART YOU, YOU HAUNT ME there, ready for me to sign. Sarah and I talked about driving a little bit, since I have a 15 YO at home and was curious about the classes she had taken. She was really sweet. I'm thankful I had them throughout the day to help get me where I needed to go. My presentation went well and I had pretty good attendance at each one, which I was a tiny bit worried about. I mean, when teens have 25 amazing authors to choose from, including some big name authors, and can only hear 3 or 4 at the most, why would they choose me? 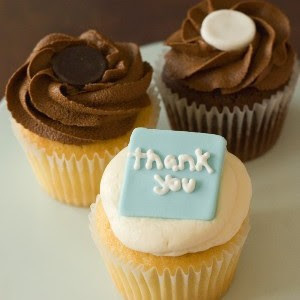 But some did and to those who did, I want to say THANK YOU!!!! I was lucky to meet some people in person who I'd previously met on-line - fandoria, Kate from Eve's Garden, ReaganStar, Lori Loveland, and more I know I'm forgetting - ack!! Oh - one cool thing that happened. A grandmother walked up to my table with two copies of IT'S RAINING CUPCAKES for me to sign. On one there was a sticky note with the name "Isabel" and the other one had a sticky note with the name "Sophie." I was a bit confused, because those are the characters in the book - Isabel is the main character and Sophie is her best friend. I said - do you want me to sign the books to Isabel and Sophie? She said - yes, Isabel is my granddaughter and Sophie is her best friend. They were born on the same day, one hour apart, and have been best friends their whole lives. WHOA!!! Anyway, I walked away feeling so blessed to be an author for young adults. To see ALL those kids there, excited about reading and books - it was just so AMAZING!!! THANK YOU ROCHESTER LIBRARIANS, TEENS, PARENTS AND FUN AUTHORS!!! This will be my last blog post of the week. 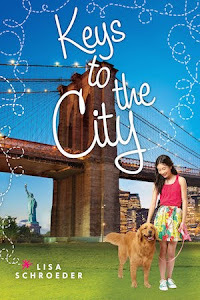 I have much to do before I leave Thursday night for the Rochester Teen Book Festival. If you live in the area, I hope you'll come out! The festival is free and open to ALL, not just teens! It's just that only teen authors are featured. And WHAT A LIST OF AUTHORS it is!! Check it out! I'm going to be brave and post the video I did for The Book Pixie's blogaversary. I haven't played the guitar very long, obviously, so my apologies to musicians all around the world! Eek!! The song comes from my novel FAR FROM YOU, and when I wrote the lyrics, I didn't have music to go with it. A few months ago, I decided it would be fun to put a tune to it, so my guitar teacher helped me, and now you can hear it for yourself! Wanted to share this link from Portland Monthly magazine that has some of my favorite books by Oregon authors. I'm honored to be in such great company! Hope everyone has a great, productive week and look for pictures next week from the festival!! Tomorrow is almost here. Which means season 4 of Friday Night Lights is starting on NBC! The wise and wonderful Sara Zarr did a blog post yesterday on fear, titled THE THINGS I CANNOT CHANGE. You should read it. Really! I've been thinking about this in particular: "Every day when I wake up, the battle seems to be: Will I go forward in courage, or be crippled by fear? In life, in writing." My thing is that, when it comes to writing, I'm often afraid I'm not good enough. That I have no business writing when there are so many amazing writers out there. Talk about a fear that will cripple you. 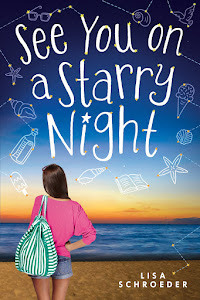 Yesterday, on twitter, my agent pointed to THIS BLOG POST by agent Jenny Bent on confidence. You should read that one too. Really! She says at the end: "Believe in yourself and your talent and your strength of will." It's easier said than done, right? Because there's that fear, always looming - what if I'm not good enough? So, how do you believe? How do you go forward in courage and set the fear aside? While we ponder this question, here are some cute kittens for your viewing pleasure. Okay, back to the question. How do you go forward in courage and set the fear aside? You don't let the fear win. Sara said, it's a battle. And it is!! But it's one where WE choose the winner. We can let the fear win and go do something else, or we can let courage win, and sit down at the computer and write. We can believe that we have a story worth telling and try to tell it to the best of our ability. And we have to know that with each word we write, we get better. As I've said before, there is no way out but through. I also remind myself, almost on a daily basis, I don't have to be as good as everyone else. I only have to be the best Lisa Schroeder I can be. And I write the story first and foremost, for me. Because I want to know what happens. That's how I get that first draft down. Kate Messner did a post on fear recently, and there are some interesting thoughts in the comments. You should read it too!! And a funny thing? As I was pondering all of this, I realized that all of my YA novels have a variation of this theme - fear vs. courage - at the heart of them. Wow. I love this quote. LOVE IT. I only recently found it, and I wish I had seen it a few months ago. It says to me - the path you were on wasn't quite right. Find a new one. And go. Before I sold my latest YA, THE DAY BEFORE, I had written a proposal and some sample pages and thought that might be my next YA book. It had a great hook, an interesting premise, and a beautiful title. I then sent my editor another idea I had for a book. She replied, telling me why she didn't think it would work well. So yeah, turned down again. About that time, I started to wonder if maybe I was washed up. I know, you're going - after only two rejections? Remember, the editor I had worked with on my first three novels was no longer in publishing. On top of that, the market is ten times more competitive today than when I sold my first novel, I HEART YOU, YOU HAUNT ME. It's tough out there. Really, really tough. Anyway, I let myself feel bad for about a week. And then, something happened. I heard Pink sing "Glitter in the Air" on the Grammy Awards show, and it ignited something inside of me. Listening to the song made me want to write a story I had just a seed of an idea for. So after worrying about whether I should or shouldn't, and what elements the story should or shouldn't contain, I finally sat down and started writing. I wrote. And I wrote. And I wrote. Somewhere along the way, my agent checked in, to see how I was doing. I'm writing, I said. Do you want me to read pages, she asked. No, I said. Not yet. The failure had given me an opportunity to begin again. I took it. And I ran with it. I wrote a book that I'm proud of. 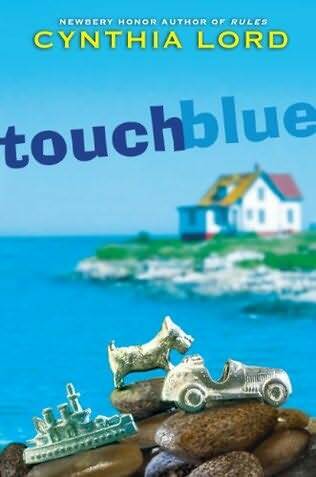 The other book, the one with the great hook, an interesting premise, and a beautiful title? Guess what? That was me trying to be someone else - someone I'm really not - in this extremely competitive market. I'm so thankful now that the book got rejected. We have to remember that sometimes we can't always see what's ahead. But we should remember that with failure always comes the opportunity to begin again. To try a new path. And that's really such a beautiful thing.